Once upon a time, there were hundreds of Stuckey’s all over America. I can remember as a child stopping in to use the restroom, passing shelves full of tacky art, pecan logs, and being tempted by the smell of greasy french fries. Billboards would announce the shops miles in advance, with their ads for 99-cent breakfast and $2.00 t-shirts. William Sylvester (Bill) Stuckey opened a small roadside pecan shop in Eastman, GA in 1936. Later on, his wife began making some tasty treats from extra pecans that weren’t otherwise sold by Bill, and soon people were drving for miles to come get a taste of Stuckey’s. Bill expanded the store and began offering other unique gifts and toys, and slowly began to franchise the concept to others. During the 1960s the chain underwent a massive expansion, spreading out of the south to open outlets up and down the newly built interstate system – eventually expanding to over 300 stores. In the days before fast food outlets and gas stations sprung up at every exit, Stuckey’s was “The Stop That Keeps America Going.” An American icon began bloomed. Alas, it wasn’t to last. Pet, Inc. bought the chain in 1964 (the same people who made Whitman’s Chocolate Samplers), and there they languished. Time started passing these stores by, and one by one they started to close. By 1985, only about 75 stores remained open. This particular outlet goes back to that 1960’s expansion – it is typical of the buildings of that era. It has a tall, peaked roof with a full glass front so that someone pumping gas could see all the tempting treats inside. Large vertical windows in the peak let the light in on even the gloomiest day. A “v” shaped awning still covers the place where four gas pumps once stood. Looking through the west windows. Front door is on the right, dining area in the back. 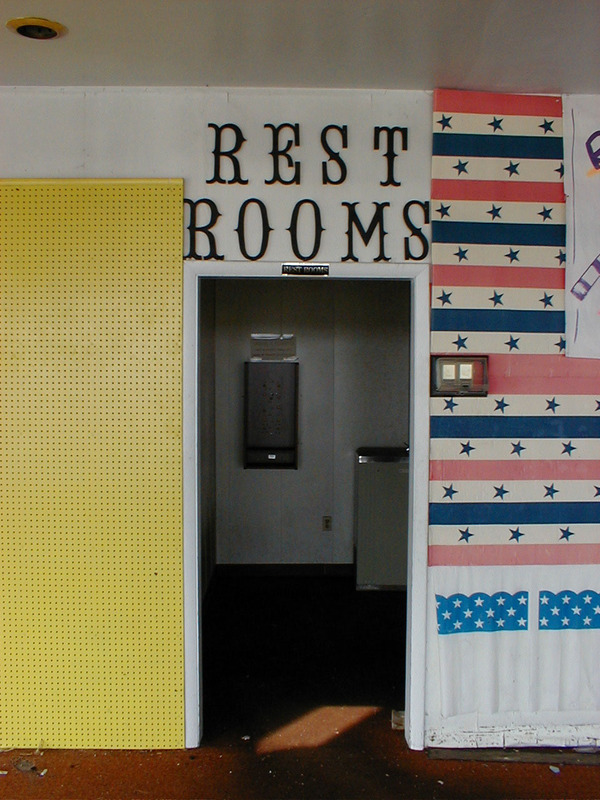 The restrooms were in the back left corner as you walked in, forcing you to march past shelves of goodies and nick knacks on the way. The dining area took the right side of the store, with a long counter in front of which one could see your meal being prepared by the grill man behind. Beyond the usual amazing array of “mexican rugs”, souvenir spoons, rubber snakes and Pecan Logs shipped directly to the stores, the proprietor would sometimes contract local artisans to resell their crafts. This meant that no two Stuckey’s were alike, and one could sample all the local “flavor” before heading off on the next leg of their long journey up the interstate, refreshed and wired with sugar. The old kitchen and serving counter in the dining room side of the long building. The shelves on the floor held fireworks for the last owner. Due to their convenient locations next to interstates, store reuse was common when they closed. Many became small home-cooking restaurants, and in Indiana, where many fireworks remain legal to this day – huge fireworks emporiums. 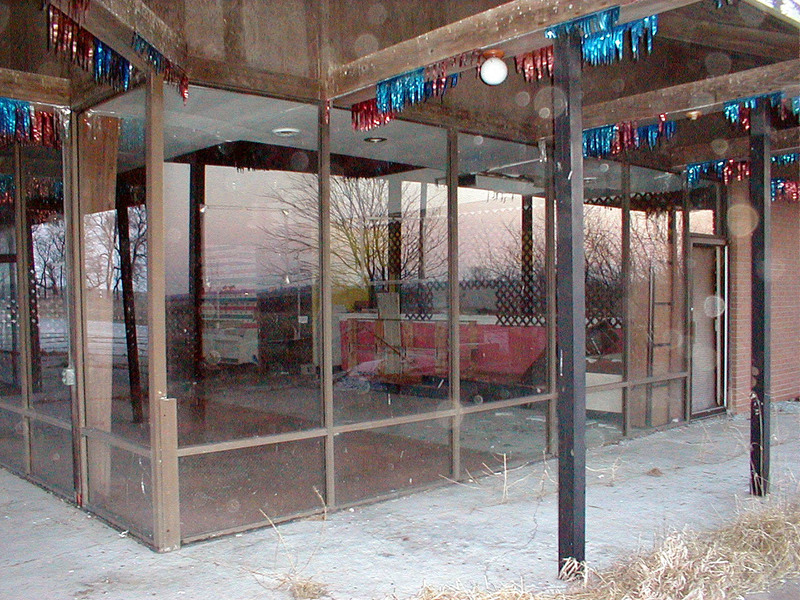 This particular building’s last tenant was a fireworks store – the red, white and blue foil fringe used to dress up the place still hangs in tattered pieces on the sides of the eaves. Inside the store the more recent owners added (now faded) streamers, stripped out all the kitchen equipment, and left the small office filled with hundreds of unused credit card charge slips. 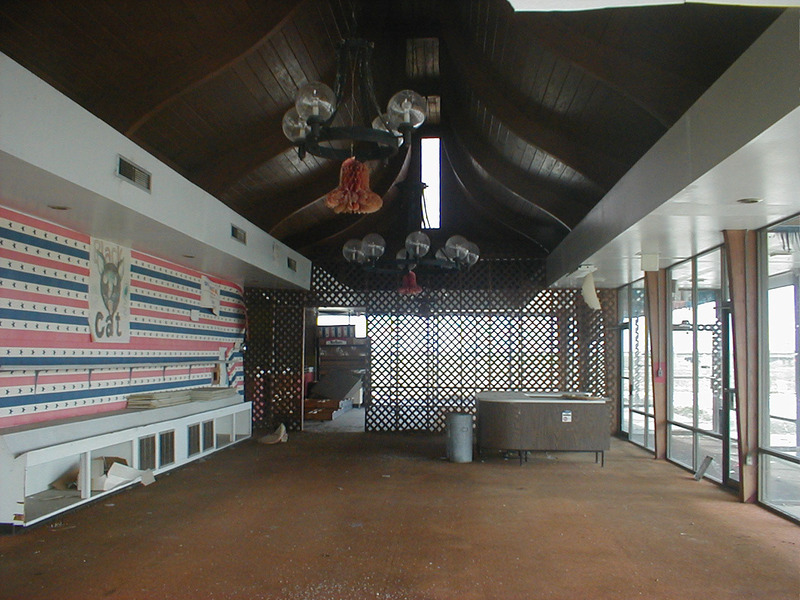 However, the exposed wood ceiling which slopes gracefully to a peak is still beautiful in its own way, despite the tacky 1970s chandeliers hanging from it. The house behind. It is attached through a storage room between it and the store. This particular store has a bonus: a small house hidden behind the building. 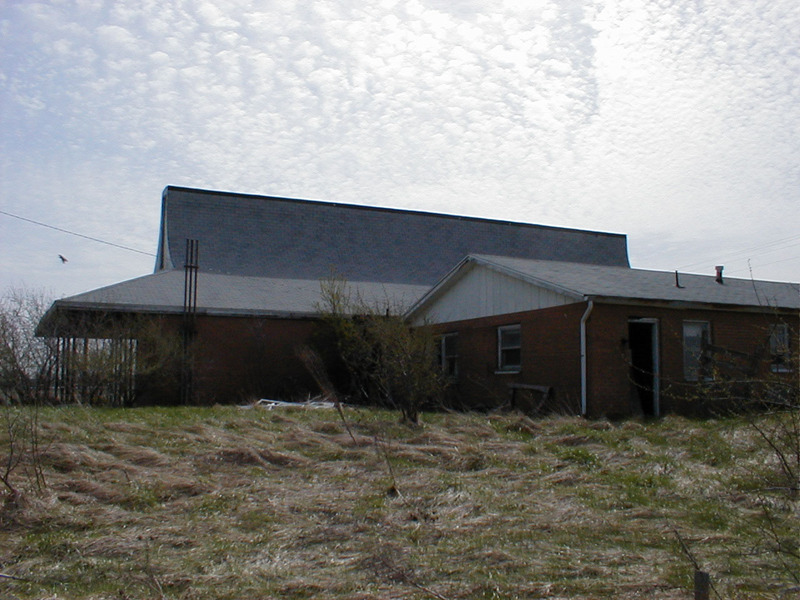 This happened often: the owners of the Stuckey’s stands often lived right behind the building, with each member of the family taking turns “minding the store”. The owners abandoned this house too: and it’s probably in worse shape inside as it has been directly exposed to the elements through several broken doors and windows. Inside are 2 bedrooms, a small bathroom, a smaller kitchen and a living room. Vandals scattered broken chairs and various pieces of junk throughout the house – and in the kitchen, a 1970s console TV sits on its side next to a refrigerator. The rest of the appliances, including a microwave and dishwasher are outside rusting in the field next to the building. The storage room from a missing door on the east side. Door on left opens behind the serving counter, door on right (not shown) opens into house. Off the storage room sandwiched between the house and the store is the furnace room, with all the equipment still intact. 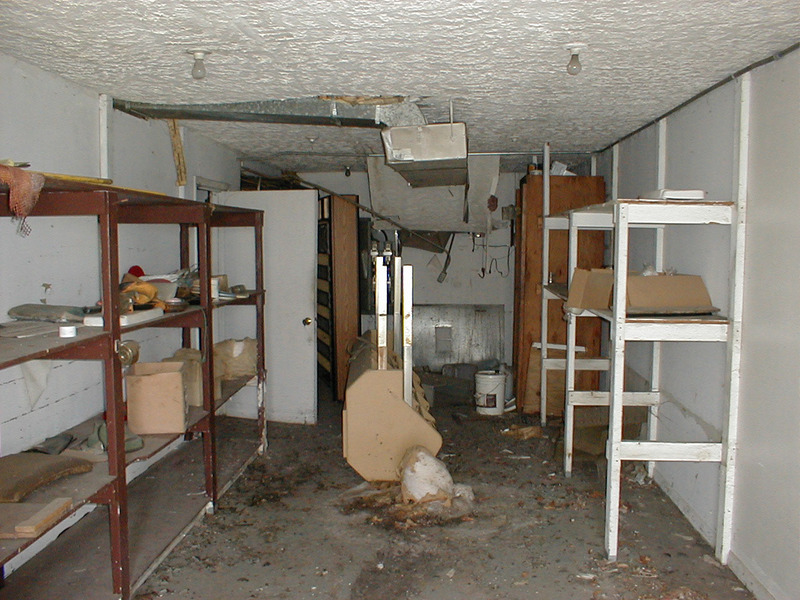 Long wooden shelves – now filled with junk – were no doubt once stocked with extra goodies and food supplies. The most interesting thing found there was a ticket stub to the Darlington Southern 500 NASCAR race from 1969 and a selective service registration card for that same year from the local board in Clinton, Tennessee for one Larry M., who had moved to Highland, Indiana by 1976 (from his voter registration card) . The store itself remarkably clean, with very little broken glass. With a fresh coat of paint, some replacement shingles on the roof and a LOT of cleaning, it could reopen easily. Welcome sight for the weary traveler. A rebirth of Stuckey’s is underway, however. In 1985, dismayed by the state of the chain, Bill Stuckey, Jr., then a 5-term congressman from Florida, acquired it. An existing Dairy Queen franchisee (and owner of all franchise rights to Dairy Queens within a half-mile of an interstate! ), he used his ability to relaunch the chain. He began by opening several Dairy Queen/Stuckey’s combination stores, and now he has launched “Stuckey’s Express”. This concept allows existing convenience store operators to carve out some floor space to create a “mini-Stuckey’s”, complete with their unique merchandise and the famous Pecan Log. Simultaneously, entrepreneurs are rehabilitating many of the old locations into new full-service Stuckey’s stores. The future looks bright for this old familiar favorite, though maybe not for this particular store. 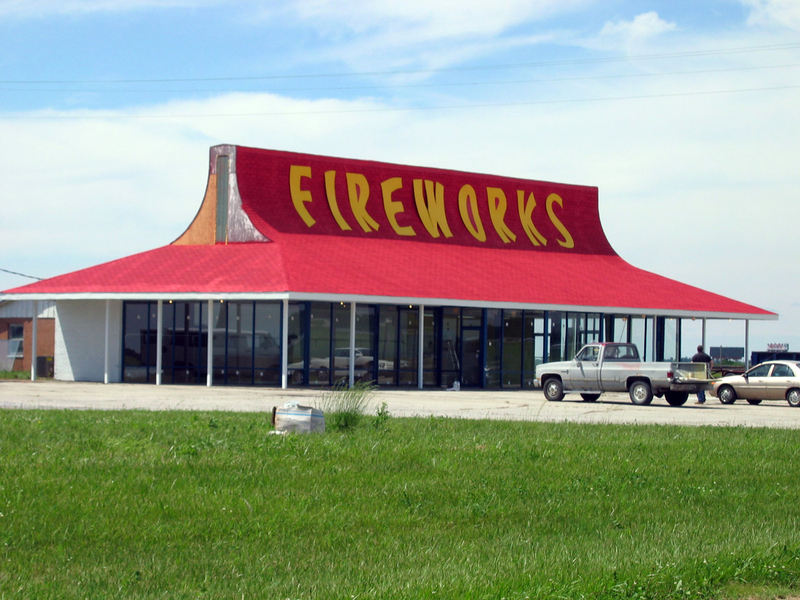 In May of 2004, owners repaired the building and reopened it as a fireworks store. 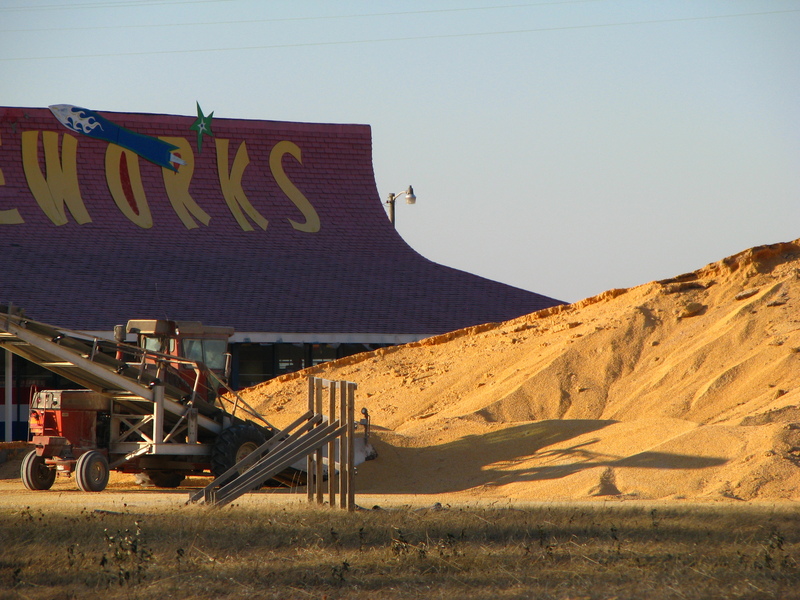 Interestingly a check of the scene in December, 2008 found a gigantic pile of seed corn in the parking lot being loaded slowly into trucks. 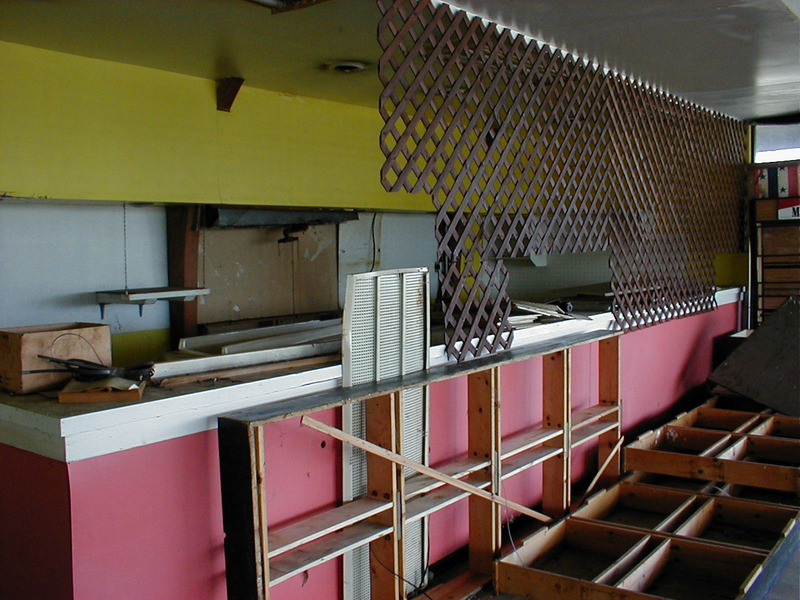 By the summer of 2010, the fireworks store was defunct and the building once again fell into disrepair. It is really a pleasant and useful part of info. I am just satisfied which you distributed this convenient facts along with us.. http://www.santorospizza58.com Remember to stop us well informed this way. We appreciate you sharing.